He had the knowledge to recognise that the young boy was about to die from a blood clot on the brain. But Dr Rob Carson knew he didn't have the right tools to deal with the emergency. Unless you count that drill in the hospital maintenance cupboard, of course. With Nicholas Rossi's life hanging in the balance, this was a time for desperate measures. And within minutes the doctor was using the handyman's De Walt cordless to bore into Nicholas's skull to relieve the pressure on his brain. Last night experts agreed that the operation undoubtedly saved the child's life. 'There were only minutes to spare,' Dr Carson revealed, as he told of the drama yesterday. Nicholas had been brought to him after falling off his bike near home. The 12-year-old had knocked himself out briefly after hitting his head on a kerb but then began complaining of a headache. His mother Karen, a trained nurse, drove him to the local hospital in the small Australian town of Maryborough, in Victoria, where Dr Carson was on duty. Nicholas was kept under observation but after an hour he began to pass in and out of consciousness, and then went into spasms. 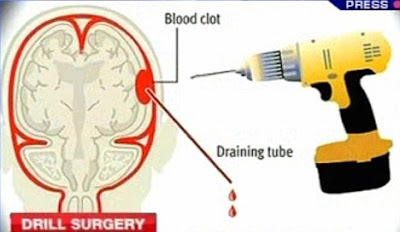 Dr Carson recognised this as a sign of internal bleeding in the skull, the result being pressure on the brain. It was the same fatal condition that claimed the life of actress Natasha Richardson after a skiing accident in March. Because the small hospital was not equipped with neurological drills, Dr Carson needed to think on his feet. He raced to the maintenance room and found the drill which handymen usually used for drilling holes in wood. Before he went further, he telephoned a leading neurosurgeon in Melbourne, Mr David Wallace, and asked for his assistance in talking him through the procedure, which he had never carried out before, even under hospital conditions. Nicholas's father Michael Rossi said: 'Dr Carson came over to us and said "I am going to have to drill into Nicholas to relieve the pressure on the brain. We've only got one shot at this and one shot only". 'Dr Carson told me all he can remember saying is: "Get the Black and Decker". Anaesthetist Dr David Tynan, who assisted Dr Carson, said the operation took just over a minute: 'It was pretty scary. 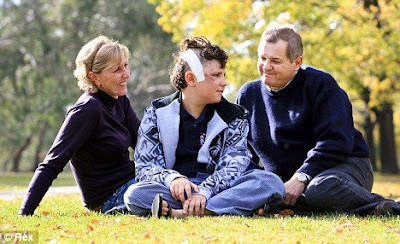 It was then decided Nicholas was stable enough to be sent by helicopter to Melbourne's Royal Children's Hospital. It was learned later that Nicholas had fractured his skull and torn a small artery between the bone and the brain just above his ear. Dr Carson remained modest amid the praise from Nicholas's family.